Happy monday everyone. I had a terrible trading performance last week because not only I missed an A+ setup but I also get impatient and traded a basic setup in USDJPY buy trade betting all my remaining balance. It was an honest mistake and I'm getting tired of going back and forth about my undisciplined behavior toward my bonus account because I treat it like a demo where I trade without care. For the last time, I'll attempt again the 11 winning streak and this time I'll have only 2 results either winning or getting a margin call. Sometimes I doubt myself about my trading ability but if I look on my personal live account, I can say that I'm still on the right path. 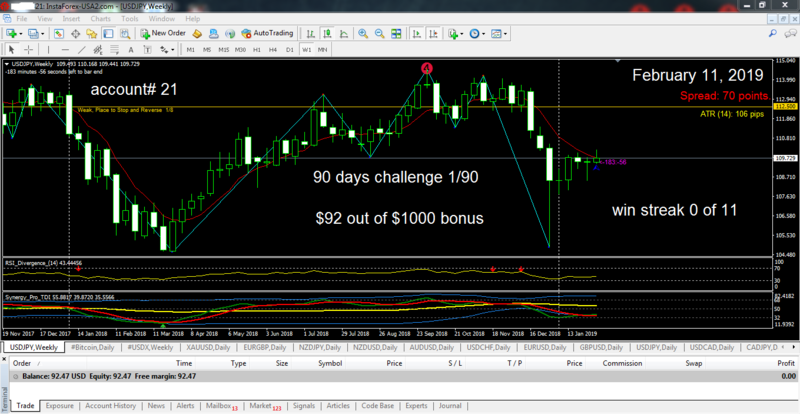 Based on my A+ setup where I can only get 4 - 5 trades per month, then I can finish this challenge within 90 days or on the month of May. P.S. The CHF went wild during the opening of the market and I hope no one got margin call from that unexpected almost a 100 pips moved. The following 28 users say Thank You to balut for this useful post. Greetings and good morning to you my friend balut. Few days ago, last week I saw your update and you was waiting for A plus set up, finally you got up the set up and you got 92$ profit in a gross total. Its a decent amount of profit, and from your trading history i got it that you have mixed taste with pair, most of profits came from usd based pair, last week usd moved too much to uptrend and you finally catch those profit. The following 11 users say Thank You to Jeinap for this useful post. The following 8 users say Thank You to fadilah for this useful post. Happy monday, balut. So you will repeat from the beginning again, right ? or you will use method that is different from before ? About USD/JPY i can't say much because for me the movement on H1 chart and H4 chart is still in limited condition. I might prefer to wait for the price to penetrate Resistance level at 110.10 or Support level at 109.62 and after that it will decide the action. Today all banks in Japan are still on holiday and also there is no data release from US. The movement of USD/JPY will move sideway or stagnate so it's not good to open position at this time. But if you believe in your setup then do the best for your trade. Good Luck, mate. The following 11 users say Thank You to dedy hari kurniawan for this useful post. CHF has shown a wild movement as you mention, i am scare of with such kind of movement and when i wake up i seen that movement and very much surprised to see this wild movement. I though CHF been too much stronger on weekend and as this result we are seeing this movement. Your trading style is too much good and specially you did some great work with nzdusd and i have done some short trade with nzdusd. i hope those trade will bring some profit today because trades are with buy position. The following 9 users say Thank You to Blackmind for this useful post. Good morning dear, dear so sad to hear about your mistakes but you know we learn from our mistakes and our mistakes are our learning source, dear finally you get good profit, this is good for you, dear always try to trade with money management and think about risk to reward ratio, because these are very important in our trading, good luck for your upcoming trades. The following 7 users say Thank You to cfd2forex for this useful post. This is a good statement of account you have here, it shows that you are a trader that knows what you are doing. It seems you are specialising on the trades of only nzdusd, audusd and usdjpy, they are all the pairs that are not moving with higher volatility, the risk of trading them will be lowered in that sense. But for the analysis on the USDJPY, you may be wrong on this analysis, the chart is still very fresh at this time you have written your report, we have to wait a little longer to make a valid analysis for today and this week. Hi, Balut, This thing happens and sometimes due to lesser patience we end up taking a lower quality setup considering it a good trade but latter realizes are mistakes. So, there is nothing to be frustrated about, just stick to the plan and follow it with discipline. And, I guess, here your plan would be to take or trade only A+ setups. For Bonus Account, I will advise you to always divide your Bonus Capital in such a way that you can atleast take 10 trades with it before getting a margin call. It's like you can only get a Margin Call, only when you loses 10 trades in a row, which is a very difficult thing to do and believe me, it's even difficult than to win 10 out of 10 trades. And, with taking good r:r trades, with such type of money management, you will breakeven and gain good amount of profit and at the same will consistently be able to grow your capital, when you are atleast winning 50% of your trades. That's the simplest way to be profitable, play with probabilities and set the probabilities in your favor, to make winning easier. The following 7 users say Thank You to MartyFish for this useful post. Good morning mate you will do scalping and most of the trades will hit the take profit area it will be a great achievement, USDJPY will be moved according ot the bullish trend and you will take risk all of you capital in this pair it will be happen sometime our opinion will be not work and trade will hit the sl, now this week many of high impact news will affect the market get pips this week and makes money. The following 5 users say Thank You to SweetRose for this useful post.